Kolkata, Dec. 7 : Football legend Diego Maradona visited Missionaries of Charity Headquarters ''Mother House'', in Kolkata today. Maradona said earlier that he had accepted the invitation to come to the city because he had a keen interest in seeing first hand the place where Mother Teresa had lived and worked. Maradona accompanied by his girl friend was greeted by the Sisters of Missionaries of Charity (MOC) and later taken to Mother Teresa''s Tomb. A huge crowd had gathered outside the Mother House to catch a glimpse of the football great and the newly appointed coach of the Argentina national football team. New Delhi - Thousands of football-crazy fans lined the streets of the eastern Indian metropolis Kolkata on Saturday to welcome Diego Maradona, news reports said. The Argentinian football legend is on a three-day trip to India's football capital to lay the foundation stone of the Indian Football School. The 48-year-old newly appointed coach of Argentina, who was accompanied by his girlfriend Veronica, seemed pleased though a bit nonplussed by the response of his Indian fans, PTI news agency and NDTV television channel reported. Kolkata, Dec. 6 : Argentine football star Diego Maradona was an hour late, but thousands waited patiently, cheering, dancing and singing to catch a glimpse of this football hero when he arrived to lay the foundation stone of the football academy at the upcoming gated community complex Eden City at Mahestala in South 24 Parganas District, West Bengal. Maradona flew by helicopter from his hotel in Kolkata to the site. On his arrival he waved to the crowds and offered air kisses. He also made the typical fighters gestures the Argentinean footballers are known to make on-field. Kolkata, Dec. 6 : Former Argentine football star Diego Maradona has arrived in Kolkata. The football crazy city gave the football legend a rousing welcome at the airport and along the route to the hotel even though his flight landed at the ungodly hour of 1 a. m. He was taken in a specially prepared luxury bus with glass windows to the hotel. Along the road, groups of fans waved and cheered at their hero, whose ‘hand of God’ for Argentina can never be forgotten by any self-respecting football fan ever. Stages were constructed in some places where people sang and danced. Kolkata, Nov. 20 :Football crazy fans of Kolkata will finally see a dream come true. 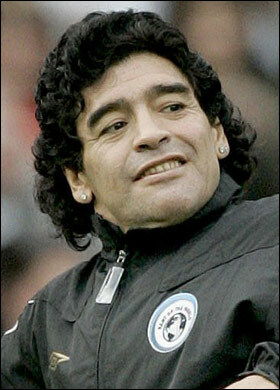 Former Argentine football star Diego Maradona is coming to the city to meet his fans next month. It does not matter to them that he no longer plays football professionally, as scintillating skills with the ball arestill fresh in the memories of football lovers here. It is more a matter of ‘sentiment’ for Bengalis. His fans still remember his master play and none can forget the ‘Hand of God” goal that he scored in the 1986 World Cup quarter-final against England. Glasgow (Scotland), Nov. 19 : New Argentina football coach Diego Maradona is reportedly distraught over fears that his daughter Giannina might suffer a miscarriage. Giannina, the partner of Argentina’s star striker Sergio Aguero, was rushed to a Madrid hospital with pregnancy complications. Maradona granted his future son-in-law permission to immediately jet home to be with her and miss tonight’s Hampden clash with Scotland, The Sun reports. London, Nov. 19 : Former Argentine football star Diego Maradona has told England to stop bleating about his 1986 World Cup ‘Hand of God’ goal. He claimed Sir Alf Ramsey’s team cheated to win the World Cup! Maradona also hit out at former England defender Terry Butcher for saying he would never forgive the new Argentina coach for his behaviour in 1986 in Mexico. Glasgow (dpa) - New Argentina coach Diego Maradona said in no uncertain terms Tuesday that his goal is to win the 2010 World Cup in South Africa, and noted that he will seek to avoid controversy with the high officials of world football. "The idea is to come first (in the World Cup), not to be among the top four. I don't like that thing about the top four at all," Maradona said in a press conference in Glasgow. The former Argentine football legend is set to make his debut as national team coach Wednesday, in a friendly game against Scotland. Glasgow - New Argentina coach Diego Maradona said in no uncertain terms Tuesday that his goal is to win the 2010 World Cup in South Africa. Glasgow - The expectation surrounding Diego Maradona's debut as head coach of Argentina, in a friendly away against Scotland Wednesday, is not catching on among fans. On Tuesday, the organizers of the game in Glasgow reduced the price of tickets, for fear of showing a half-empty Hampden Park but also to avoid a financial disaster. Although organizers said in recent days that they had requests for some 250,000 tickets, only 27,500 - half the stadium - had been sold by Tuesday. London, Nov. 18 : Former England footballer Terry Butcher has said that if he comes across former Argentine footballer Diego Maradona, he would like to thrash him severely for his 1986 “Hand of God” goal in the World Cup. More than 22 years on, Maradona probably does not know the full extent of the pain he has caused to Butcher. Hamburg - The tie between England and Germany at the Olympic Stadium in Berlin may be the most high-profile international friendly on this week but much attention will also be on Diego Maradona's Argentina, who take on Scotland in his first match in charge. Maradona arrived in Scotland to a hero's welcome at the weekend with Scottish fans clambering for autographs, many clutching a picture of his "hand of God" goal against England in the 1986 World Cup. All web searches for the country's most famous son: football player Diego Maradona were blocked by Yahoo! Argentina after a judge's temporary restraining order. The world knows Maradona for his sleight of hand in the 1986 World Cup quarter final between England and Argentina, and presently he manages the Argentine national football team. However, if someone searches his name into Yahoo! 's Argentina-based search engine, he would get only the news results. Dusseldorf - New Argentina coach Diego Maradona has an ambitious plan for his side: he wants to win the 2010 World Cup in South Africa. "That is the issue, is it not? If that is not my goal, then I might as well have stayed at home and spent some time watching television," he was quoted in Saturday's issue of the Cologne-based newspaper Express. Maradona captained Argentina to their last World Cup triumph in 1986, when the South Americans beat Germany 3-2 in the final. Munich - Bayern Munich defender Martin Demichelis expressed his delight Friday at a visit from new Argentina head coach Diego Maradona. The former playing great stopped over in Munich for talks with Demichelis and fellow Bayern Argentine Jose Ernesto Sosa Thursday evening as he continues his preparations for his first match in charge. "You can't ask for more when Argentina's greatest football idol and the last World Cup winning coach (Carlos Bilardo) come to Munich to visit me and Jose," he said. Buenos Aires, Nov 6 : The Argentinean Football Association (AFA) last evening officially appointed veteran football great Diego Maradona as the next coach of the national side. AFA president Julio Grondona formally announced Maradona’s name for the post, saying he was “extra special”. Sao Paulo - Brazilian football legend Pele made clear his scepticism as to the likelihood that Diego Maradona might be successful as coach of Argentina's senior team. "Great stars, great players do not usually make good coaches. And sometimes a footballer that was not so brilliant in his career becomes a great coach," Pele noted, in comments that Brazilian media published Thursday. Pele and Maradona are regarded as the two great candidates for the title of the best football players in history. Buenos Aires - Former Argentine football superstar Diego Maradona has been named coach of the country's national team, he confirmed Tuesday after a meeting with Argentine football federation President Julio Grondona. The news followed a meeting Tuesday that Maradona and former national coach Carlos Bilardo held with Grondona. "Now the real work begins," Maradona said. The legendary footballer will be introduced as Argentina coach on Thursday, his 48 birthday. Since his playing days, Maradona has struggled with drug problems, spending long periods in treatment, while also battling his weight and suffering heart ailments.